What impact do wages have on economic growth? Ozlem Onaran and Engelbert Stockhammer write that the size of wages as a percentage of state GDP has been falling across the world. They argue that this poses a problem because the negative impact on aggregate demand caused by this falling wage share is not offset by a rise in investment and net exports, as many mainstream economists believe, which damages economic growth. They state that a wage-led recovery as a way out of the crisis is economically feasible, requiring the establishment of sufficiently high minimum wages as well as macroeconomic policies reversing welfare state retrenchment and financialisation. There is an ongoing debate about the effects of the recent recovery in Britain on real incomes. Real wages are still 5 per cent or so below their pre-crisis level. This is part of longer term trend and needs to be put in context. Subdued wage growth has been a characteristic of advanced economies since the late 1970s. In what sense has wage growth been subdued? When nominal wages grow below productivity growth plus inflation, the wage share is falling. This is what Britain has been experiencing in the last three decades; even before the crisis in 2008, the share of wages in GDP was 8.8 percentage-points lower than what it was in 1975. Britain is not alone. Figure 1 shows the share of wages in GDP at factor cost (adjusted for the labour income of the self-employed). The share of wages in GDP fell dramatically in both the developed and developing world during the neoliberal era of the post-1980s. 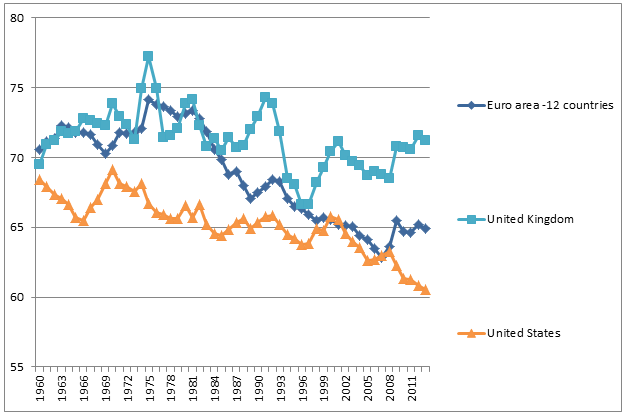 Indeed, the fall in Britain or the US seems to be more moderate than in continental Europe; but this is to a large extent because top managerial wages, which have increased sharply in the Ango-Saxon countries, are treated as part of labour compensation in the national accounts. If we could correct the national accounts to exclude the working rich and calculate the wage share of the 99 per cent, the fall in Britain could mirror the larger fall in labour share seen in Europe, which is about 11 percentage points in the same period. Should we worry about this? Yes, and not only because we care about equality, but also because we care about jobs and sustainability. Mainstream economics continues to guide policy towards further wage moderation, along with austerity, as one of the major responses to the Great Recession. The main shortcoming of this is that it treats wages merely as a cost item. Post-Keynesians disagree: wages have a dual role affecting not just costs but also demand. When income is redistributed from wages to profits, three things happen. Consumption decreases, since workers or people on a lower income consume more of their income compared to the capitalists or the rich. Investment may respond positively to higher profits, and net exports increase due to lower labour costs. Theoretically, the total effect on demand, hence growth, can be positive or negative, depending on the relative size of the effects on consumption, investment and net exports. If the total effect is negative, a lower wage share leads to lower growth; and the economy is called wage-led. If the total effect of a lower wage share, hence higher profit share on growth is positive, the economy is profit-led. Mainstream economic policy assumes that economies are always profit-led, whereas in reality the relationship between the wage share and demand is an empirical matter, and depends on the structural characteristics of the economy. Empirical research by (Onaran and Galanis, 2013) for a range of developed and developing countries shows three important facts: First, when the share of labour falls, the fall in consumption is much larger than the rise in private investment; hence domestic demand contracts. Investment is more about demand, business expectations, and state’s industrial policies than about profitability as such. Second, foreign trade forms only a small part of demand in large countries, such as Britain or Europe as a whole, and therefore the positive effects of a decline in the wage share on net exports do not suffice to offset the negative effects on domestic demand. Finally, wage shares did not fall in only one single country, but there is a global race to the bottom in the wage share. A simultaneous wage cut in a highly integrated global economy leaves most countries with only the negative domestic demand effects. Beggar-thy-neighbour policies cancel out the competitiveness advantages in each country and are counter-productive. A race to the bottom in wage share leads to lower global growth. Then, how did Britain, or the world economy grow on the run up to the Great Recession despite a falling wage share? Debt-led consumption seemed to offer a short-term solution to aggregate demand deficiency caused by falling wage share in countries like the US, UK, Spain or Ireland until the crisis. This was enabled by financial deregulation and housing bubbles. The mirror image of the debt in these countries has been an export-led model of countries like Germany, or Japan. In these countries exports had to compensate for the decline in domestic demand due to a similar fall in the wage share. However this model also proved to be unsustainable as it could only co-exist with debt and current account deficits in the other countries. The Great Recession has been an expensive lesson on the fragility of this model. Sadly, the recovery in Britain is built on a similar shaky ground, where household debt and house price inflation are substituting a strong wage growth as the engine of demand. The good news is that a wage-led recovery as a way out of the crisis is economically feasible. For the large wage-led economic areas with a high intra-regional trade and low extra-regional trade, like Europe, macroeconomic and wage policy coordination towards a higher wage share can improve growth and employment. At the global level, Europe and Britain would be the main beneficiaries of a coordinated wage-led recovery. Globalisation is not in itself a barrier to egalitarian policies. The solution to the current race to the bottom requires a step forward by some large developed economies in terms of radically reversing the fall in the wage share at home first. This, in turn, can create space for leveling the global playground through international labour standards and domestic demand-led and egalitarian growth strategies rather than export orientation based on low wages in the developing countries. How can we reverse the course of the last three decades? Has it been an inevitable consequence of the so-called skilled bias technological change or globalisation as the IMF or the European Commission repeatedly tell us? No, a rich body of research and a recent paper by Stockhammer (2013) in the tradition of political economy shows that the most important causes of the fall in the wage share has been the fall in the bargaining power of labour, welfare state retrenchment, and financialisation. The solution lies in reversing this process through a reform to increase the bargaining power of the unions and the collective bargaining coverage, establishing sufficiently high minimum wages as well as macroeconomic policies to bring back the public goods and welfare state, and to re-regulate finance. Ozlem Onaran is Professor of Workforce and Economic Development Policy at the University of Greenwich. She has contributed to the book Wage-led Growth. An Equitable Strategy for Economic Recovery. Engelbert Stockhammer is Professor of Economics at Kingston University. He has also contributed to the book Wage-led Growth. An Equitable Strategy for Economic Recovery.